E-commerce sales in the fourth quarter soared 12.1% from a year ago to a new record of $132.8 billion (seasonally adjusted). For the whole year 2018, they blew through the $500 billion level for the first time, reaching $513.6 billion. 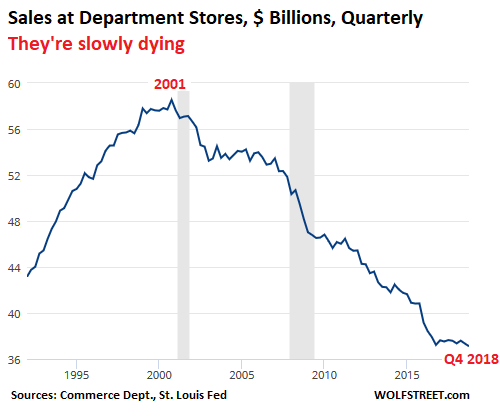 Department store sales have plunged 37% since their peak in 2001 - not adjusted for inflation - to $37.1 billion in Q4 2018, a new record low in the data going back to 1992. These are the stores that anchor malls. Retailers that have decided to carve out a future for themselves have invested heavily in their online operations, including in their fulfillment and delivery operations. Department store sales hit a new record low in the data going back to 1992. E-commerce sales in the fourth quarter soared 12.1% from a year ago to a new record of $132.8 billion (seasonally adjusted), the Commerce Department reported on Wednesday morning. For the whole year 2018, e-commerce sales blew through the $500 billion level for the first time, reaching $513.6 billion, up 14.2% or $64 billion from a year ago. Not seasonally adjusted, e-commerce in Q4 jumped to $158.5 billion, 11.2% of total retail sales. E-commerce sales have doubled over the past five years. E-commerce includes sales by the online operations of brick-and-mortar retailers, such as Macy's (M), Walmart (WMT), and Best Buy (BBY), along with the sales of online-focused retailers, from small operations all the way up to Amazon (AMZN). People still say that e-commerce accounts for only 11.2% of total retail sales and, therefore, doesn't matter. But this metric is misleading, because e-commerce doesn't yet seriously compete with a number of retailers, including gasoline stations, new and used auto dealers, and grocery and beverage stores. These three categories alone account for 52% of all brick-and-mortar sales. Sales at these mall-based stores that are under attack from e-commerce fell to $159 billion (seasonally adjusted) in Q4 2018, a level they'd first reached in Q4 2005, while e-commerce sales soared to a new record of $132.8 billion. And the above chart is not even adjusted for inflation! 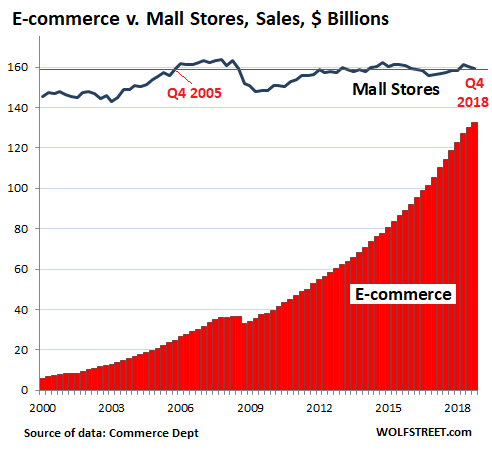 E-commerce is killing these stores, one after the other. Department store sales have plunged 37% since their peak in 2001 - not adjusted for inflation! - to $37.1 billion in Q4 2018, a new record low in the data going back to 1992. These are the stores that anchor malls. The sector is populated by the brick-and-mortar stores of Macy's, bankrupt Sears, soon-to-be bankrupt J.C. Penney (JCP), liquidated Bon-Ton Stores, and Nordstrom (JWN), whose booming online sales were already one-third of its total sales in Q4, while its brick-and-mortar sales declined. Store closings by retail chains and malls losing their anchor stores are now a painful routine. The largest mall landlord in the US, Simon Property Group (SPG), said in its last earnings call that the company's president is sitting on "his 200th unsecured creditors committee." That's how many bankruptcies and restructurings SPG's tenants have gone through so far. Sales at electronics and appliance stores, despite the booming business in electronics and appliances, have dropped 11.3% over the past 10 years to $24.4 billion in Q4, as much of it has migrated to online operations, including to the successful online operations of brick-and-mortar retailers such as Best Buy. Americans have figured out that buying a large-screen TV or a dishwasher is easier and often cheaper online, with delivery and installation - same issues as with a local store - included. And buying smaller electronics online has become normal years ago. Retailers that have decided to carve out a future for themselves have invested heavily in their online operations, including in their fulfillment and delivery operations. Many of them are succeeding in these efforts. This isn't about Amazon - this is about thousands of small and large retailers that are making this transition successfully. It has taken two decades to get this far, and it will take many more years to play out completely. And those that fail to make the transition will fall by the wayside. Nordstrom just did a surprising thing that other major retailers keep a secret: It disclosed how its own booming online sales, now one-third of its total sales, eat its brick & mortar sales. But it's a matter of survival. Read... "The Biggest Retailers Are Too Scared to Disclose this Data. But Nordstrom Just Did."